A long, hot day of playing "where's Waldo" ...searching for chicks to confirm successful fledging. Just flying away from the nest does not indicate a successful fledge. We must see them land safely somewhere and return to the nest to eat. They can get into a million different kinds of trouble post fledge, but we can monitor carefully to determine that they have fledged successfully. And honestly, it's kind of fun searching for them. I always am learning more about them, the more time I spend observing at different stages of development. I got to finally meet up with one of my new monitors today. It's always so hard to connect....and we were finally in the right place at the right time. I love watching with the volunteers so I can explain some behaviors, point out the clues that I am observing, what the vocalizations and behaviors may indicate. Right now I am sitting here watching the nest of Mr Mom. Wow. When I arrived our single dad was perched nearby, watching over his youngsters. I don't mean to anthropomorphize , but he did look proud, confident, and quite comfortable with this situation and his role. He is now quite used to caring for these chicks. They are very big, beginning to flap furiously and are clearly preparing for fledge. Now I know I am very biased, but I am sitting here thinking these are the most beautiful chicks I have ever seen in my 24 years. I wish they were banded so we could follow their lives. It looks like it might be two males and one female. Dad took off for some dinner. The chicks were not food begging but crops were looking a little empty. They must be eating a lot now at this stage of development...and it will only get worse. But I am certain that this male is up to the task of fishing constantly. They are always well behaved, with no fighting for fish, which means the food supply is sufficient. Dad returns with a large goldfish. Oh how funny.....I laughed out loud! As I was just saying, they are well behaved, so all three lined up around Dear old Dad, expecting him to feed them. But Dad said, ya gotta grow up and feed yourselves...and he left the fish and moved to a perch nearby to watch. They all stared at the fish...no one lunged for the fish. They looked at each other. SO FUNNY! Finally one decided to grab the fish, politely, and begin eating. The others watched and food begged quietly. Believe it or not, they took turns at the fish....each one eating some and then walking away so another could take a turn. I love these guys....each and everyone of this osprey family has touched my heart. I sit here with my hand over my heart. Pop better go get a couple more fish! Sweet! The theme song from the old Mary Tyler Moore show went thru my head...."you're gonna make it afterall!" First of all, Paul McCartney was great.....and you know who else is great? Our single dad...Mr Mom!!!!! He has successfully gotten those chicks thru another week and all are big, beautiful, with food in crops. He was not there when we arrived, but I could quickly count all three chicks lounging in the nest. Perhaps 15 minutes later Dad arrived with a fish and fed the chicks. Every week, they are closer to fledging....as so many other chicks are around town...so I celebrate each week. As I check nests now, it's more of a challenge....when chicks have fledged we need to try to find them. Today I found an empty nest, but as I talked to a woman who was out walking she told me she saw the dad hunting over the field. But I realized Ospreys don't hunt over fields and she described short loops and I knew it must be a fledgling she was seeing. I easily found the youngster perched on a fence. And then heard another young one whining for food and flying with his legs dangling down, one of those funny behaviors of chicks who don't quite get the skill of pulling up the landing gear. So all accounted for at that nest. Mom was also flying and dad brought a fish and then retreated to his perch in a tree. The chicks are self feeding now. I love it when I find them all. I saw a couple more chicks that have fledged successfully today....boy, monitoring gets tougher when ya gotta search for them! But that was one of the fun things about the reintroduction project...having to find all the chicks every day, post fledge. I was pretty good at it. But now we must walk around, look, listen, pay attention to what the adults are looking at...a successful visit is accounting for each family member...sometimes a challenge, but I love it. Sometimes we do find a chick on the ground and must rescue the youngster and get it back to the nest. And after a tough week, I am signing off for a few days....heading off to see Sir Paul McCartney!!!!!! Fourth row seat! And there is a chance I will never come back....just follow Paul. After last nights rain, the Arboretum Cam has cleared a bit, revealing one chick. I ran out here and am watching in person and we appear to have lost one chick. The nest is behind a locked gate so I cannot drive closer, and I hesitate to walk in and disturb the family since I do not want to scare the remaining chick into pre fledging. I sadly also discovered that another chick on another nest nearby is also gone. I have contacted some people at the Arb to see if there is any more info, if a body was found beneath the other nest. I was last out here in person on July 5. I am watching too many nests to be able to visit more often, sadly, and the person I was counting on to monitor nests in this area just disappeared without telling me that she would not be able to fulfill her commitment to visit some of these nests. I am so dismayed this year by this kind of behavior. All I ask of the volunteer monitors is that they tell me if they will not be able to honor their commitment. I understand that things happen, people's lives change, people go on vacation etc....my only request was, just let me know so I can plug in someone else or check nests myself. To simply disappear, leaves me to figure it out slowly and data is lost. It is so irresponsible. But that is what I am up against. Anyway, that is the sad current update. If great horned owl predation was the cause of these losses, we may lose this chick also. It has been a problem in the past at the Arboretum. I have done the best I can this year, but it is not good enough. Without more reliable help, I cannot get all the data we wanted to. I wish I were able to do more. Without cooperation from more people and organizations, my hands are rather tied. I work 7 days a week...there is no more of me to spread around. It's been a tough weekend and some things have happened that may end this project. As I wait for the dust to settle tho I wanted to let you all know that I did check on the single dad raising chicks. I arrived with angst wondering what I would find, but immediately saw three chicks heads pop up! Yeah! Dad was not there tho. I waited for about 15- 20 minutes and Mr Mom flew in with a fish. Two chicks bellied up to the bar and the third hung back. He fed the first two until they wandered off to the far side of the nest, and then the third chick got some fish. Mr mom stayed for a short time, preening a bit and watching over the chicks before he flew off towards the lake again....yup, that third chick needed a little more food. I waited for another fish to arrive, but with so many nests to check, I headed out after another 15 minutes. All is well, all chicks are fed, they look great, looking like they are about 5 weeks old now, no down showing between the feathers anymore, and the tail feathers are about 4" long. Every week we are closer to fledging, which means they could fly away from a predator, but of course, fledging brings its own dangers. But every week I am more hopeful that this male may actually pull this off. We still have a few weeks to go tho....but, wow! It is so amazing to observe him. Oddly emotional! I also checked some other nests that are in other parts of town, on very high structures....transmission towers, cell towers etc and they are all well, chicks all accounted for, so they survived the storm last week which cost us 6 chicks. I visited fifteen nests today in the area that one of the nests blew down and I am happy to report I found no other chicks missing, no nests damaged or down. Whew! I will continue to check some more nests this weekend in other areas....hoping for no bad news. I will also check on our single dad and his family. Thanks also to the volunteers who checked their nests and luckily, all the news from them was good so far. So very sad to report that we lost some chicks in the storms last night, July 11. I have recieved two reports of young that perished....two chicks blown out of one nest, found dead on the ground this morning. Another entire nest blown down, completely gone and with it three chicks. This is the new nest that I spent six hours at reading the bands on the adults. Glad I got that information, but I grew attached to the family during those six hours. This is a male who has lost many chicks over the years for various reasons. Heartbreaking. I will try to check as many nests as I can in these areas over the next few days and I hope all is well on other nests. Volunteers check your nests....especially on the northern parts of the metro. When you follow these birds for as long as I have, and read bands, document their moves and their failures and successes over many years, it's not always easy to accept how tough some of these birds lives have been. Some birds have extraordinarily successful lives, producing many chicks without many losses. Others just seem to get slammed over and over, with storms and predation. Of course they don't emotionalize things the way we do...they just keep working, keep moving forward. Build a new nest, find a new mate if necessary. Try again next year. And I just watch and document how the years unfold...tho my understanding of these individual birds lives is so rich, so full, and sometimes so heartbreaking. nares, crops had food in them, no sibling aggression observed. They wandered away from Dad and the fish, so presumably were full! I was so pleased to see them all doing well. I am amazed by this male. He is doing everything he possibly can to care for these chicks....he needs a little luck too. Hoping the weather does not become severe tomorrow. I am getting emails about the Arboretum osprey cam. First of all I need to let people know that I do not run the cam. It is run by the University of Minnesota Landscape Arboretum. I do send behavioral updates for the public relations department to post ( after they rewrite them as they choose) because I have 24 years of experience studying these birds. The current problem is that the Ospreys have pooped all over the camera lens. Ospreys project their mutes (poop) to keep their nest clean, which works beautifully, but in this situation is a bit of a disadvantage! It would be far too disruptive to the birds to clean the cam, so we must wait for a heavy rain to wash the cam off. Patience! I know it is frustrating to not be able to see the chicks, but hopefully the problem will be solved soon. It might rain today! An update on the single banded male with chicks. I visited the nest today and spent 3.5 hours observing. When I arrived the chicks were alone, tho I was surprised to clearly see that there are three chicks here. A lot of mouths to feed. After about 30 minutes a male arrived, but it was not the right male! He was unbanded! He stood on the edge of the nest looking at the chicks. He slowly moved around the edge of the nest, examining the chicks from all angles. My mind was trying to grasp what was happening. He seemed so calm and accepting. The chicks did not run to him, they just watched him quietly. He was there for nearly 30 minutes before the banded resident male came flying in with a fish, chirping all the way. This is the vocalizations they use to talk to other Ospreys. He flapped furiously as he landed which is a defensive behavior. The other intruding male took off as soon as he saw the banded male approaching. The resident male finally calmed down and fed the chicks. The intruder returned, circling the nest and trying to land. Our male said, NOPE....off with you. He lunged at him, flapped his wings and chirped loudly. The message was clear. The visitor tried several times and then a small hawk, looked like a sharpie, started dive bombing the extra osprey. He was hot on his tail, chasing that osprey in a very fierce manner! Ah, must be a friend of the resident Ospreys, trying to help out! Funny. It worked, and the other osprey quickly departed. The male calmly finished feeding the chicks. Now he has his wings out, providing a cool spot for the chicks to take a little siesta in the shade. He is stuck in a sea of chicks and can't move. Mr. Mom. All is well here so far. 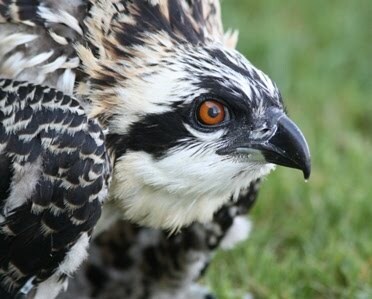 My dear osprey is managing to dig deep and be the hero he needs to be. It looks like other Ospreys may be the greatest problem here, tho that visitor made no aggressive moves towards the chicks. I am so proud of this male with the checkered past. He is stepping up to do what needs to be done. I look at him and wonder if he knows how magnificent he is. Gosh, I love these birds. Hard to tear myself away....but I have been here nearly four hours now. Time for a cool drink in the shade for me too. Happy Fourth of July to all the Ospreys and osprey lovers...may your evening be cool and quiet. There is always something to worry about in the osprey world. Many of you see a fair amount of drama on the osprey cams around the world, and those sorts of things occur all the time without people even knowing. Sadly I have discovered a nest that has a female missing. She was there a week ago but yesterday and today, I found no female. Chicks were left alone for quite a while and then the male arrived with a fish and fed the chicks. I watched for several hours yesterday and today. It took several visits to be sure she was nowhere to be found. My heart breaks for this family. I have known this male for quite some time and I could write a book about him. His behavior has always been unusual since his first known nest attempt at five years of age. He has continually surprised me. I won't go into all the details now but suffice to say, although he is an experienced male who has successfully raised chicks in the past, he has never been a particularly devoted male. Today when I arrived the chicks were alone again. He finally arrived with a fish and fed the chicks. He then flew off, and my heart sank. These chicks need shade and protection. But he returned in minutes and shaded the chicks and watched over them. That is how I left them. For this nest to succeed, he will have to muster some heroic effort. I was tearing up as I observed him as he has been thru so much in the past. I ponder how his confusing thoughts and instincts must be pulling him in different directions. He seemed to be trying to continue his usual male role with the focus on provisioning, but at one point he perched near the nest and looked back at the chicks with no female shading them, and then he returned to the nest, and the chicks huddled beneath him. The instinct to care for his offspring is strong, tho he must leave the nest to feed them. He looks around a lot, as if he expects the female to return. This is a new wrinkle and he seems to be trying to adjust. I will watch over them as closely as I can, since this is something I have never observed before. I so want him to pull this off. The chicks look to be about 3.5-4 weeks old...about half way to fledging. I am thankful that they are a little older, with some feathers and the ability to thermoregulate, so they have a better chance of surviving the times when he is gone. I do not want to call much attention to this nest, they need no extra stress from people. I know there is a cam with a male caring for chicks alone in Ontario Canada, so we will see what both of these males can do. Keep your fingers crossed and think good thoughts...very good thoughts. Please.